If there were a competition for the least attractive railway in London the North London Railway would, until very recently at least, have won hands-down. The East & West India Docks & Birmingham Junction Railway was originally conceived to give the London and Birmingham Railway a freight route from Camden to Poplar and the West India Docks. The line opened in 1850/51, joined the L&B at Chalk Farm and ran through Camden, Canonbury, Hackney, Bow and Poplar to the docks. The E&WID&BJR became the North London Railway in 1853. In 1853 the Hampstead Junction Railway proposed a line from Camden to Willesden, serving Hampstead Heath, Finchley Road and Frognal, and Kensal Rise. This little line interested the LNWR (as the L&B had become) as Camden Junction was, by this time, getting very busy and an alternative route to Willesden would mean they could put off widening the main line through Chalk Farm and Kilburn. However, the line was troublesome to build. Problems with local landowners and collapses in Hampstead Tunnel meant that the line was not completed until 1860. By 1867 the LNWR had absorbed both the NLR and the HJR and the whole route became collectively known as the North London Railway. Most of the NLR was double track, but the section from Broad Street/Western Junction to Camden Road was quadrupled in 1873. The subject of our model will be the station at Finchley Road and Frognal in the period 1959/60. To add operational interest, we have speculated that wartime pressures necessitated the quadrupling of a further 3 miles to Finchley Road and Frognal. We also convinced ourselves that, if we added a spur to the MR at West Hampstead, we could fully justify the additional 3 miles of quadrupling. This sounds great in theory; the track improvements would certainly have improved line capacity, would have provided the LNWR with better access to Maiden Lane Goods and Devons Road, as well as improving links with the LNER at St Pancras Junction and Canonbury, the MR at Gospel Oak and the LNWR at Camden. However, in reality it would have been impossibly costly, not least because of the need to bore a second troublesome tunnel under Hampstead Heath. Because we have tampered with history we thought it inappropriate to use its later name of Finchley Road and Frognal and will instead revert to its pre-1880 name of Finchley Road (St Johns Wood). All surrounding structures will, however, be based on those at Finchley Road and Frognal during our chosen period and we have also tried to blend our track modifications into the actual track layout of the time. In so doing, we hope that the model’s location will still be recognisably Finchley Road and Frognal. As well as local services, the real NLR saw steam operated trains from Feltham, Temple Mills and Ferme Park, plus electric services to/from Broad Street, Watford and Richmond, so a very varied selection of stock can legitimately be run. 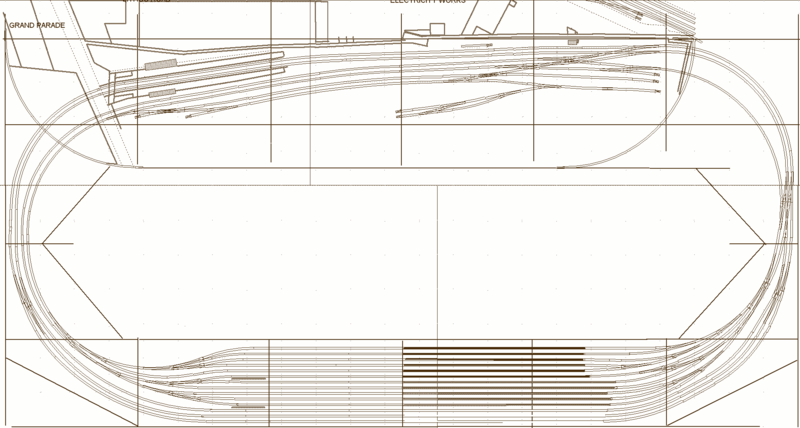 This will allow us to provide a continuous procession of interesting, prototypical trains for the viewing public. To see the progress being made on the model, have a look at the pictures here. When we tested the water for new layout ideas we eventually decided trying a model based on an actual location. A brief review of the North London Line (Hampstead Junction Railway section) suggested Finchley Road & Frognal as being suitable, being very busy with freight from all regions and an intense local passenger service with through trains on excursions and the like. It also had a small goods yard, unlike many stations on the North London. An added benefit was discovering Great Western steam engines were banned from the line!. Rather than tell the story of our research, here's a collective summary of investigations and sources. I needed to review my railway magazine collection, and so started systematically looking for articles about railways across London. Complete articles occasionally occurred and were gleefully extracted, in particular some gems around the operation of Feltham yards and trains observed at Acton, both of which included working timetables. There were also a good number of photos of cross-London trains, with train type, locomotive, date, starting and destination points all noted. Book catalogues and internet searches revealed a host of books relating to London, with a handful dedicated to the line itself. The Middleton Press example of the North London Line gave us an early version of the Finchley track plan and surround, and a chance purchase led to the revelation that a branch was proposed from Finchley to Harrow, before the Midland burrowed under. We've used this proposal as justification for the branch we've added to our plan. Ebay proved to be invaluable - a number of North London-related working timetables have been picked up, along with examples from traders at Warley and British Railway Books. We've also managed to pick up an original 1959 timetable leaflet for the line, the very year on which we're basing the layout. These provided much information about train workings, but we've also purchased railway rulebooks and a copy of an LMS employee booklet stating the limit of numbers of coaches and wagons throughout the line, according to locomotive type. Despite my 'Midland Tendencies' I've joined the London & North Western Society, which has its own library for borrowing, and resulted in us obtaining a large scale copy of the Finchley track plan of when the line was being electrified. Another has joined the North London Railway Historical Society, whilst the Stephenson Locomotive Society, Historical Model Railway Society and Railway Correspondence & Travel Society all provide great sources of information - letters/emails to the editor of RCTS brought forth personal memories of the line, and all have extensive photographic libraries. You'll also find that some of the societies have web discussion groups through which one can discover extra information - for instance, we now know the running numbers of the Oerlikon EMUs still running in the period before the class 501s were introduced. One of our members had occasion to work in London, and so paid a visit to Holborn Library, holders of Camden History Society archives. Here he found a copy of 1959 Kelly's directory, and so we now know the business names for the shops around the station. The offices at Kew are well known, but as yet we've not organised a visit. However, the internet allows a review of what Kew has, through Access To Archives railway section. Again largely accessed through the internet, but a visit is planned to English Heritage at Swindon to view the Aerofilms archive of north London with some reasonable hope we'll find relevant photographs. There are also many, many collections viewable on the web, and this has provided a superb record of locomotives and stock which actually worked the line, as well as views of the area in web pages such as Francis Frith, Science and Society and English Heritage. We've managed a couple of visits to the area to photograph everything still extant from 1959 - which isn't a lot!, but still invaluable. The internet site for Camden provided links for the local history society, and also allowed on-line views of planning applications, which often include maps. There's also sections on planning rules, including reviews of areas with planning & preservation restrictions because of their history, giving an insight into vernacular architectural styles. We appealed for information to the public of Swiss Cottage & Hampstead through the fine pages of the Ham & High. We got only one reply, but that reply yielded two photographs of trains at Finchley in the 50s. We also have the offer of publishing an update of progress at some point - all publicity is good publicity! This has an enormous library of books and photographs, but also displays the real thing - as would any preserved railway of course. The NRM archive produced works drawings of the Oerlikon EMU sets for us to obtain copies, along with allowing us to photograph and measure an original motor coach displayed in the old goods shed. Included last, but absolutely not least, because the searches that can be made will deliver all manner of leads and results. Keep searching; you can never have too much information. Some of the web pages we've found useful are on the links pages. All this research has proved very rewarding and educational and could easily become a hobby in its own right. Despite being based on Finchley Road & Frognal in 1959, the model will still end up as our adaptation of the original. Much of the real place will be modelled accurately, but being enough removed from the original that anyone saying "it wasn't like that" can be politely shooed away! The diagram below shows our current track plan for Finchley Road. As you can see, it is very different from either Sutton or Cheriton Bishop. For a closer view, click on the image.